Home > News > It’s 44 Stories, Empty and Covers a St. Louis Block. AT&T Tower Gets Auctioned Next Month. It’s 44 Stories, Empty and Covers a St. Louis Block. AT&T Tower Gets Auctioned Next Month. 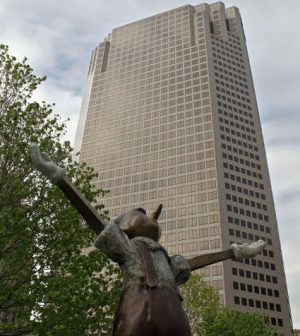 From St. Louis Post-Dispatch: The largest skyscraper in St. Louis, the former AT&T office tower at 909 Chestnut Street downtown, is headed to the auction block next month. The auction date is slated for April 16, with a starting bid of $7 million, according to Mission Capital, the company overseeing the auction. The property covers a city block, between North 9th & 10th Streets and Pine & Chestnut Streets. Bondholders of the 1.4 million square foot building were unsuccessful in their efforts to sell the 44-story property last year. The building has been vacant since AT&T moved out of the tower and into two neighboring buildings the company owns in September 2017. Inland Real Estate Group bought the building from AT&T in 2006 for nearly $205 million.